NVIDIA announced a new series of notebook GPU’s today branded as the 700M series. Introduced today are five new graphics cards in total, and NVIDIA said they would be available in a long list of laptops over the next few months. The five new graphics cards include two options aimed at the “mainstream segment”, the 720M and the 735M, while the remaining three, the 740M, 745M, and 750M, will be “for the performance segment” of the market. The graphics cards are being touted by NVIDIA to “maximize performance and experience,” but they also more power efficient than their predecessors. Because the 700M Series is notebook-only, expect these to be less powerful than a desktop version of the 700 Series that may be announced sometime in the future. Helping our new 700M chips reach such lofty levels of performance is GPU Boost 2.0, a GPU innovation that extracts every ounce of available computing power from the graphics processor. Before GPU Boost, GPUs were held back by synthetic benchmarks that pushed chips and power usage to the limit, far beyond the levels typically seen when playing games. This ‘worst case scenario’ forced us to throttle GPUs, leaving spare performance on the table when playing games.GPU Boost resolves this problem by monitoring power usage and temperatures, enabling the GPU to use every last ounce of performance without exceeding safety or comfort limits. While the press release from NVIDIA said the new GPUs will be available in nearly every notebook maker other than Apple, it is possible these GPUs will be seen in the next-gen MacBook Pro with Retina Display. The current 15-inch MacBook Pro with Retina Display sports a NVIDIA 650M GPU, as does the high-end 21-inch iMac model, so an upgrade to the 700M series only makes sense. NVIDIA today announced five new notebook GPUs which deliver a trifecta of technologies that seamlessly and automatically maximize a consumer’s notebook performance and experience. New NVIDIA GPU Boost™ 2.0 technology, which intelligently adjusts GPU clock speed to maximize graphics performance. GeForce® Experience™ software, which adjusts in-game settings for the best performance and visual quality specific to a user’s notebook and keeps GeForce drivers up to date. Incorporating all three of these technologies, the new lineup of NVIDIA GeForce 700M GPUs includes GeForce GT 750M, GeForce GT 745M, and GeForce GT 740M GPUs for the performance segment, as a well as GeForce GT 735M and GeForce GT 720M GPUs for the mainstream segment. NVIDIA GeForce 700M GPUs are available today. Every leading notebook manufacturer will be introducing notebooks with GPU Boost 2.0 technology, including Acer, Asus, Dell, HP, Lenovo, MSI, Samsung, Sony and Toshiba. 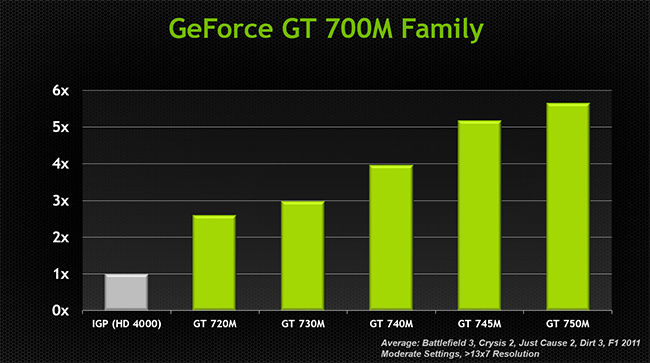 More information about the GeForce 700M family of notebook GPUs is available at www.GeForce.com.